With self-islanding accomplished twice this year, Duke looks ahead to more commercial applications for battery-backed grid resiliency. Duke Energy has spent years building out its concept of a utility-controlled microgrid, one that can be put together from standard parts and rolled out to customers at large. But the real tests of whether its technology is ready to move from demonstration to commercial scale can come in a matter of milliseconds. 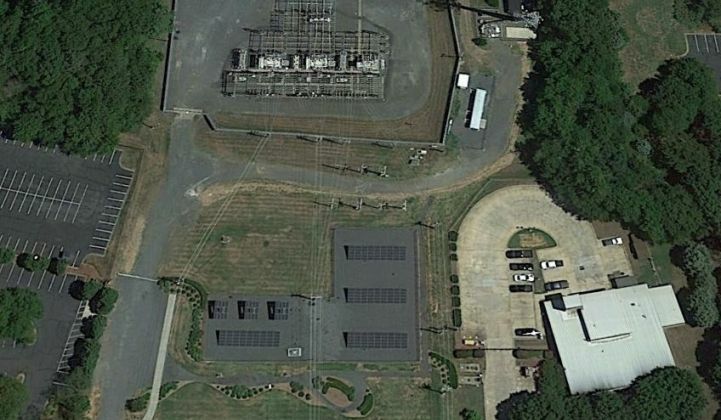 For Duke’s McAlpine microgrid test site in Charlotte, North Carolina -- a fire station connected to a substation with a 50-kilowatt solar array and 500-kilowatt lithium-ion battery -- these moments of truth came in two discrete events this year. The first was a series of lightning strikes during a violent thunderstorm on the evening of April 30, according to Tom Fenimore, technology development manager at Duke’s Emerging Technology Office. The second was on September 8, when heavy winds and rain blown in by Hurricane Hermine threatened to disrupt grid power stability. In both cases, the microgrid successfully sensed a grid disturbance, disconnected from the larger grid, and then kept the fire station’s lights, computers and communications gear running for about a minute, before determining that the threat of power loss had faded, and reconnecting to the grid at large. The power grid at large didn’t actually go down during either event, he noted -- but that was OK. What’s important is that the system reacted to grid disturbances by switching from on-grid to off-grid within less than 100 milliseconds, without any human intervention. “We don’t wait for the circuit to go down. We sense that it may go down and act accordingly,” he said. That’s a critical step, given that the substation’s solar array and battery require this super-fast disconnection to be able to stay up and running during any real outage. And, unlike the large-scale facility and campus microgrids that rely on their always-running co-generation or combined heat and power (CHP) systems to ride through outages, Duke’s McAlpine microgrid doesn’t have any spinning generation. Despite this, a June test showed the fire station was able to run on solar and batteries for 26 hours, and that was during “an extremely hot day, with all the air conditioning running,” said Fenimore. Duke’s McAlpine site wasn’t started with the idea of backing up a fire station. The utility installed its 50-kilowatt solar array in 2009, and added its 500-kilowatt lithium-ion battery array from BYD in 2012, with the goal of testing various “virtual power plant” applications using smart meters, home energy management systems, customer-sited solar, electric-vehicle chargers, and other distributed energy resources. That experimental work (PDF) also included nearly 200 lines of sensors with communication links for remote and immediate outage and fault detection, as well as data acquisition. In 2014, it started to automate the test circuit by adding microgrid controls from partner Schweitzer Laboratories, to allow the automatic islanding and automatic re-sync capabilities that came into play in this year’s islanding events. Notably, all of these islanding actions take place on the utility side of the fence, so to speak. The fire station is directly connected to the battery and solar-equipped substation, which isolates itself from the rest of its grid connections during grid disturbances. That’s why Duke is calling it a “utility-controlled, single-customer microgrid” -- it doesn’t require the customer to install any of its own equipment, and on the utility side, it relies on “using equipment we could get out of the Duke Energy storeroom,” said Fenimore. “We were able to set that up using our standard switching equipment -- the reclosers, our standard protection and control relays, and our standard control systems,” with Schweitzer’s microgrid controller integrating with Duke’s SCADA systems that allow its grid operators to manage the substation as part of its distribution grid. All of this work is informing Duke's plans to make this kind of utility-controlled microgrid available on a broader basis. “We have customers that have come to Duke and asked us to look at microgrid configurations. That ranges from the Department of Defense, to cities and municipalities, to college campuses,” he said. Utilities across the country are exploring the potential of multi-party microgrid projects and ownership models along these lines, according to GTM Research’s latest report, U.S. Microgrids 2016: Market Drivers, Analysis and Forecast. Duke has a lot of different microgrid experiments underway, both on the technology side and the business-model side. Besides the McAlpine project, Duke’s Emerging Technology Office has been working on a second project at its Mount Holly, N.C. test facility, to test how a new standard, the Open Field Message Bus, can allow more than than 20 different technology vendors’ equipment and software to interoperate. On the business model side, Duke -- or more specifically, REC Solar, the commercial solar developer it bought a majority stake in last year -- is involved in an interesting commercial campus microgrid project with Schneider Electric at its Boston campus. The project, launched in February, will use Schneider’s inverters, battery storage systems, and grid and building energy control systems. But REC-Duke will own and operate the system under a 20-year power-purchase agreement.